Start your search for Madison homes for sale here. This site has been designed with top-of-the-line search technology that can make your home hunt easier, more efficient, and even fun. But we know that sometimes even the best technology can be overwhelming. 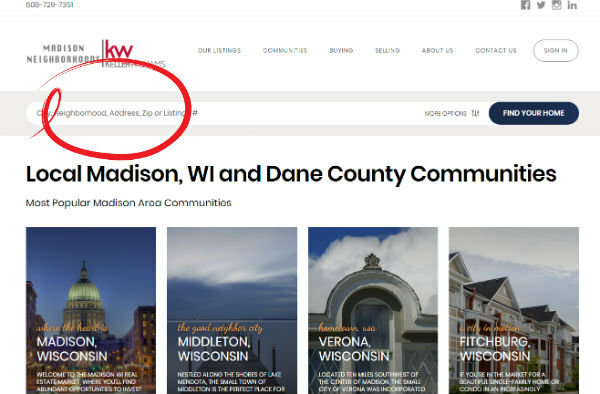 That's why we've taken the time to create guides to help you through the process of finding properties on the Madison and Dane County real estate markets. If you need help searching our MLS listings, take a look at the guides below. If the question you have isn't answered below, please don't hesitate to contact us for personal assistance. We're happy to help, and we're glad to update this guide too. If you're not quite sure what you're looking for—or need some tips to get you started—connect with our team or try our home finder for help with the first few steps. Have a specific city, neighborhood, or even address in mind? Our basic search bar lets you find what you are looking for with ease. 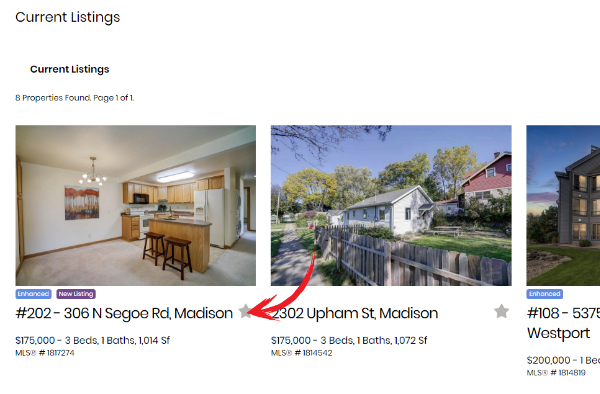 It can be found at the top of every page on this site—including this one!—and lets you explore homes for sale across the Dane County real estate market. To search, just begin typing in the name of a city, neighborhood, address, zip code, or MLS listing number. Our autocomplete feature will make helpful suggestions based on what's already found in the MLS. Finishing typing or select a query from the suggestions and then click "Find Your Home." Bookmarking or saving a listing is easy once you've found it. 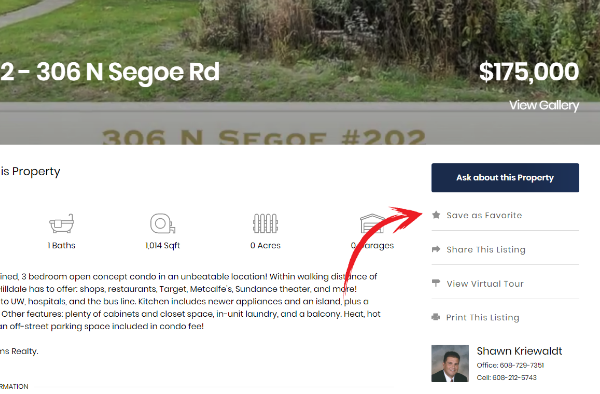 To save a listing for later viewing, just click the star ★ icon near each listing result or the star ★ icon (labeled "Save As Favorite") found on each listing's details page. You must be registered for this feature to work. To access your saved properties, make sure that you are logged into the site, then select "My Favorites" from the drop-down menu near the top-right corner of the navigation. Every current listing that you have bookmarked will appear and can be revisited from this list. 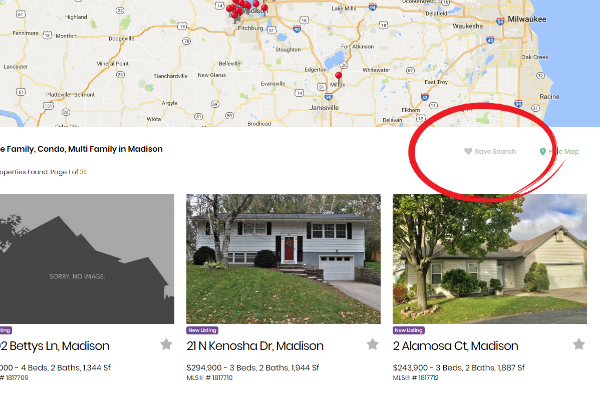 If you are searching for the same types of Madison homes for sale all of the time, there's a faster way. You don't fill out the search form each time you search. Instead, you can create a saved search for one-click access to search results. To Save your search, click the "♥ Save Search" button found at the top (and just below the map) of any listings results page. Want to receive updates when new properties matching your saved criteria appear on the market? Saving your search allows you to receive daily listings updates via your e-mail address. This will keep you informed about the latest properties available and ensure that you don't miss out. Daily listings messages are enabled by default. To disable them, make sure that you are logged into the site, then select "Preferences" from the drop-down menu. Unclick "Yes, I would like to receive listing updates matching my saved search criteria" from subscription settings and then save. Looking for a new home in a particular Dane County school district? You can use our advanced search features to narrow your hunt. Type your query into the search bar (or leave it blank to browse all properties) and then click "More Options." When you scroll down the menu that appears, you'll quickly find a number of options for narrowing your search by district or even particular elementary, middle, or high schools. Our autocomplete feature will make helpful suggestions based on what's already found in the MLS. Finishing typing or select a query from the suggestions. Finish scrolling, and hit the "Find Your Home" button at the bottom of the page to complete the search. You can use the "More Options" button again at any time to tweak your search. If you are interested in finding Madison homes for sale that are listed as a foreclosure, short sale, or bank-owned property? You can use our advanced search features to narrow your hunt. Type your query into the search bar (or leave it blank to browse all properties) and then click "More Options." From the drop-down menu that appears, you can choose to include/exclude foreclosures, short sales, and bank-owned homes from your search. Finish scrolling, and hit the "Find Your Home" button at the bottom of the page to complete the search. As you are browsing the listings, you can use the "More Options" button again at any time to tweak your search. Only on the market for waterfront properties? Dreaming of more than an acre on which to ramble about? Absolutely need a fireplace to warm your toes? Or maybe six bathrooms? Remember, you can use the "More Options" button at any time to narrow your search. Type your query into the search bar (or leave it blank to browse all properties) and then click "More Options." From the drop-down menu, you can choose any or all of the features you are looking for and then click the "Find Your Home" to complete the search. Need answers that you don't see here? Contact the Dane County Market team for advice and assistance during every step of your Madison home search.